677 Table Lamp by Elio Martinelli for Martinelli Luce in Italy, 1970s. 677 Table Lamp by Elio Martinelli for Martinelli Luce in Italy, 1970s. You are here: Home » Vintage Furniture, Lamps and Accessories » Lamps » Table Lamps » 677 Table Lamp by Elio Martinelli for Martinelli Luce in Italy, 1970s. 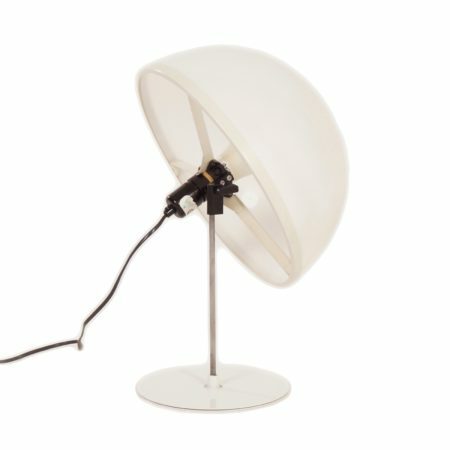 Rare Elio Martinelli table lamp model 677 for Martinelli Luce Italy, 1970s. The shade can rotate by means of a set screw (see pictures). It concerns an original old rare version (+/- 40 years old). Given its age this table lamp is still in original and good condition, small hairline at the set screw, further in very good condition. Material Plexiglass and iron. Colour: White and silver colour. Fitting: E27 / max 60W. Dimensions: h x w x d = 50 x 36 x 36 cm. Marked with the Martinelli Luce logo and the model number 677.